Is your little girl getting ready to celebrate her first Halloween? Maybe you’re aiming to give your bundle of joy an even better Halloween than last years? Well, get the cameras ready! When you dress your infant up with this Tinker Bell Deluxe Costume, she will be all smiles and you’ll want to capture as many of those moments on film as you can. Tink is one of the most iconic characters to have ever come out of the wondrous works of Disney, and now your kiddo can be transformed into this lovable fairy. Need another costume for the other apple in your eye? Well, then simply grab an Infant Peter Pan Costume and your babies will look ready to fly off to Neverland! You may want to make sure to keep your windows closed… with enough trust and faith (and a wee bit of fairy dust) anything is possible. Now, this Tinker Bell Costume may be Deluxe but we can’t include the fairy dust (trust us it's easier that way). However, what this Deluxe costume does offer is a lovely puffy green skirt along with a beautiful set of wings. 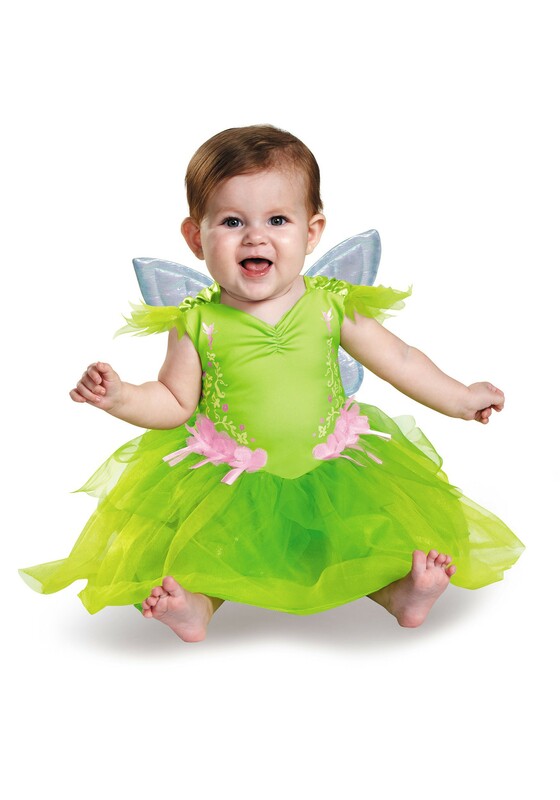 Your little girl will be the cutest fairy in the neighborhood with this adorable costume! Give your baby an absolutely magical Halloween with this great Disney-themed costume. She’ll be ready for an amazing adventure. Whether it be taking down captain hook or collecting candy, with this costume you’re little girl will surely be successful! Grab her a wand and she’ll be ready to charm the whole town.